Place oven rack in center of oven and preheat oven to 425F. Coat baking pan with cooking spray. Put beef, scallions, 2 Tablespoons of cilantro, 1 teaspoon each of garlic and cumin, ½ teaspoon of salt, paprika, cinnamon and drained bulgur in a large bowl; combine ingredients with your hands until well-mixed. Roll meatball mixture into twenty-four 1 ¼-inch balls; place on prepared pan. Bake until lightly browned and cooked through, about 10 to 12 minutes. Meanwhile, to make dipping sauce, in a small bowl, combine yogurt, cucumber, radish, dill, remaining Tablespoon of cilantro, and remaining ¼ teaspoon each of garlic, cumin and salt; mix well. 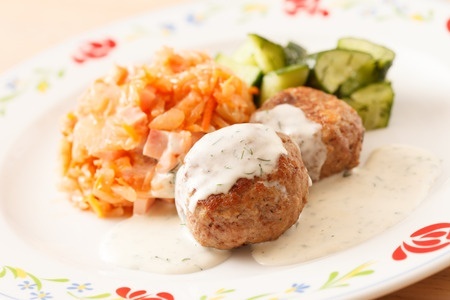 To serve, place meatballs on a serving platter with toothpicks and spoon sauce into a small bowl.